Fully engraved panel lines. Highly Detailed cockpit interior & bomb bay. Optional position landing gear & bomb bay door. B-29's four Wright R-3350-23 eighteen cylinder Cyclone engines each gave 2,430 horsepower for war emergency and 8,198 gallons of fuel enabled it to carry up to 20,000pounds of bombs 3,250 miles and return. 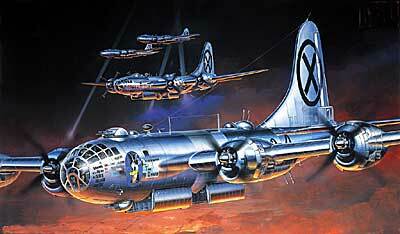 The B-29 had a range greater than any other bombers of its day. With a pressurized fuselage and two superchargers on each engine, the new ship had a service ceiling of 31,850 feet. The Superfortress, whose name was adapted from it's smaller brother, the B-17, was also the heaviest in the skies, having an empty weight of 70,140 pounds and a gross of 110,000 pounds; and a top speed of 358 mph made it one of the fastest. The fire control system of the B-29 was the most advanced yet. Four gun turrets with twin 50 cal. machine guns were remotely controlled from within the fuselage. Forward protection was afforded by the upper and lower positions just behind the cockpit. A manned tail position offered the bite of a 20mm cannon in addition to the twin 50's to anyone venturing to close.